Mar 18, 2019 | Uncategorized, What Am I Reading? 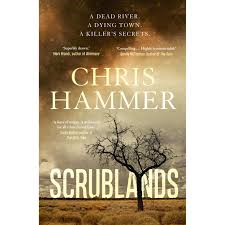 Journalist Chris Hammer’s crime novel Scrublands (Allen & Unwin Books 2018) burst onto the scene with a lot of fanfare as an addition to the genre ‘outback noir’, which includes books such as Jane Harper’s The Dry. But there are many things this book does well. One is the mirror the story holds up to journalist Martin Scarsden’s own behaviour, and the questions the novel asks about the role of investigative or frontline reporters and their motivations. The truth is not always pretty, and one suspects that as an experienced journalist himself, Chris Hammer has had a lot of time and probably much lived experience to inform his contemplation of these issues. And that career also serves the content of the book well, bringing a ring of authenticity that comes directly from Hammer’s journalistic background. The way the reporters approach the story, the hierarchal directions from above, the communication between rival journos, the engagement with locals, the push to file before deadlines, all of this is not so much expressed, as just there, woven into the fabric of the story, and it feels real and true. Hammer does great dialogue and really captures the personalities that inhabit the lonely towns of inner Australia, and he has done a great job of giving each character – from a very large cast – their own backstory and history. And finally, the novel asks some important questions about PTSD and military service, ambition and reputation, familial sacrifice and the legacy of traumatic events.